MasterQ2: the Q stands for 'Quality', y'know. PSP Audioware has released MasterQ2, the logically-named follow-up to its MasterQ plugin. This is designed as a creative EQ tool for both mixing and mastering. Offering seven filters, all with adjustable frequency and Q, MasterQ2 can operate at sample rates ranging from 44.1 to 192kHz. The EQ graph displays the EQ curve and characteristics of each filter, and you also get a selection of limiting and 'soft-clipping' algorithms. PSP says that MasterQ2 can be used as both "a precise, surgical EQ for mastering, or a colour processor for sound design and mixing." A demo version is available, and you can get it at the discounted price of $99 for the remainder of March (regular price is $149). 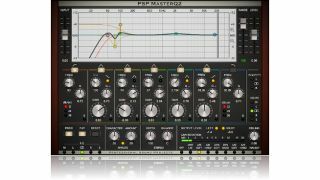 MasterQ2 is available in VST/AU/RTAS/AAX formats for PC and Mac. You can find out more on the PSP Audioware website.